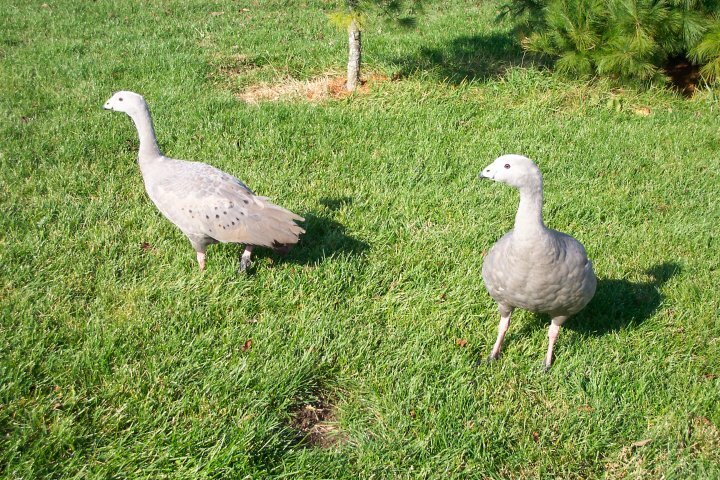 Our farm is home to a pair of Cape Barren geese, appropriately named Bonnie and Clyde. We call them our "guard geese". They are much more apt to alert us to strangers than our laid back guard dog. Bonnie and Clyde are a lot of fun and provide us with a constant source of entertainment. 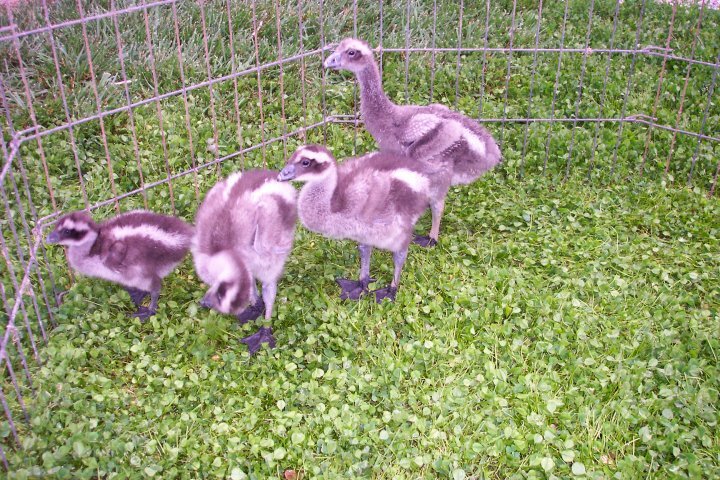 Keep reading to learn a little about Cape Barren geese. 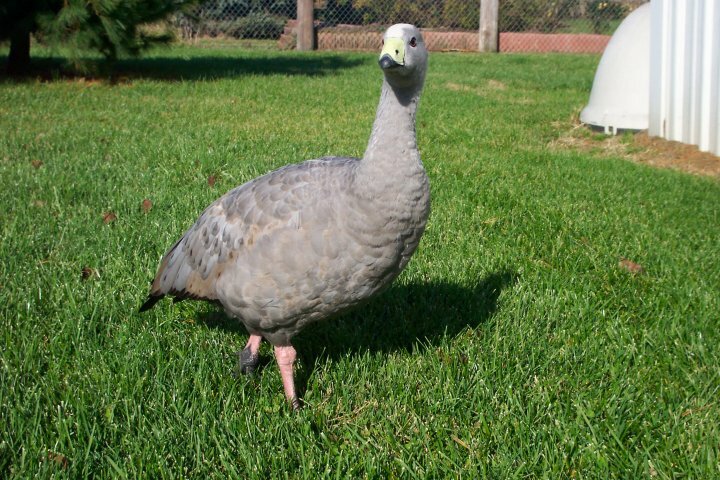 Cape Barren geese are about the same size as domestic geese. It's plumage is pale grey, with black markings near the tips of its wing feathers and tail. It has pink legs and black feet. It's most striking feature is the bright greenish yellow cere on its short black bill. Cape Barren geese live mostly on small, windswept and generally uninhabited offshore islands, but venture to adjacent mainland farming areas in search of food in summer. Their ability to drink salt or brackish water allows numbers of geese to remain on offshore islands all year round. By the 1950's their numbers were so low that biologists feared they may be close to extinction. Various initiatives have been taken which have increased the goose population to a level no longer considered to be in danger. However, they remain one of the rarest of the world's geese. Cape Barren geese are found along the southern coast of Australia and also in Tasmania. These geese are grazing birds, and eat predominantly the common island tussock, as well as spear grass and various herbs, pasture grasses, and clover. Geese lay eggs in nests in the tussocks found in the open grassland areas in which they live. Each pair of geese establishes a territory in autumn, prepares a nest site and defends it noisily and determinedly against other geese. About five eggs are laid and the eggs take about a month to hatch. 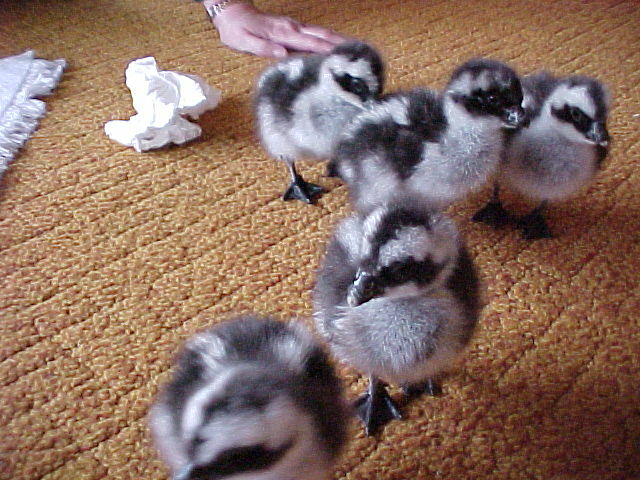 The goslings develop rapidly during the winter, and by the end of spring are able to fly. We now own a second unrelated pair of geese, aptly named Archie & Edith (Bunker!). 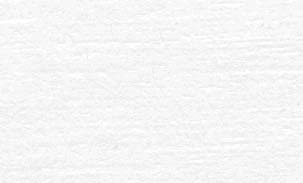 Pictures are shown below.